A great package for betting fans. So, you are searching for a new bookie and Palmerbet caught your eye. Well, it is your lucky day because you will find out everything you need to know about this 100% Aussie owned betting agency right here at Aussiebet. 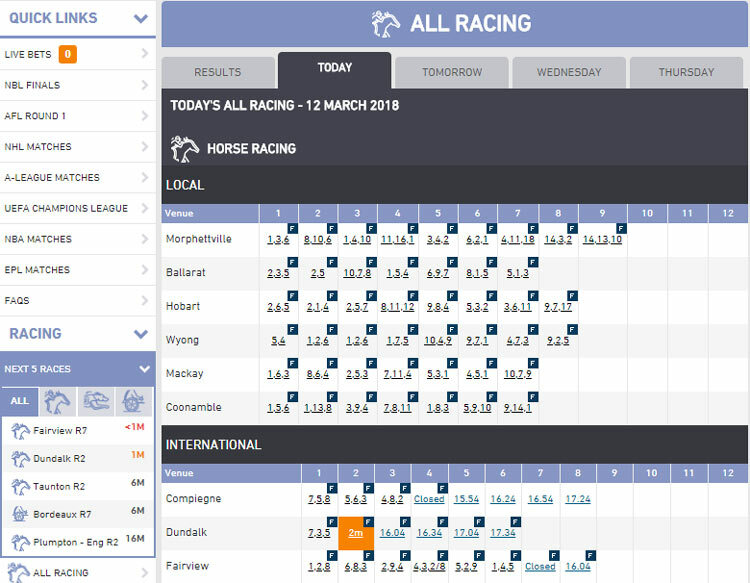 Our in depth Palmerbet review looks at all aspects of their online product, including but not limited depth of available markets, quality of odds and security features. We consider the positives as well as the negatives. So, for an unbiased take on what Palmerbet have to offer just read our Palmerbet review below. 100% Aussie owned and proud of that fact. Decent odds on for sports. Free tips for members on the Palmerbet Blog. Odds for horse racing could be more generous. No Cash out or live streaming facilities. Palmerbet is licensed in NSW and their operations have been based there since the company was started by Ted Palmer over 30 years ago. It is a real family affair with his sons Grant and Andrew running the show nowadays. Palmerbet are official betting partners of the AFL, ARU, Tennis Australia, Cricket Australia and NRL. For patriotic punters, Palmerbet is the perfect choice. Palmerbet is a 100% Australian-owned betting company that has an online presence since August 2013. The Palmer Family have had a long association with horse racing, and they still have pitches on all Metropolitan Sydney tracks. Their headquarters are at Canterbury Racecourse and the company is now run by Grant and Andrew Palmer. One of the main ways betting companies reel new customers in is by offering a sign-up bonus bet. Palmerbet are no different, and they have a very generous sign-up bonus for new customers. When you open a new account with Palmerbet they will match your first deposit (max $250) in the form of a bonus bet. Use the promo code PBBONUS250 If you are a resident in VIC, NSW, WA or SA you do not qualify for this bonus. To find out how to claim your Palmerbet sign up bonus check our step by step guide below. Open an account with Palmerbet by clicking here. Make your first deposit which must be at least $10 ($25 if using BPay). Palmerbet will match your first deposit with a bonus bet up to a maximum of $250 (exc VIC, NSW, WA, SA). Any Bonus Bet winnings must be turned over at least twice (x2) on WIN bets with a dividend greater than $1.80 per $1 bet before funds can be withdrawn. Multibets will not count towards turnover unless one leg is $1.81 or greater. A sign up bonus might snare a bookie new customers, but it takes regular promotions to retain them. Some bookmakers are far better than others when it comes to rewarding existing customers, and Palmerbet usually have some decent offers. They offer regular promotions across a wide range of sports and we are pretty sure you will like most of them, and you will also benefit in some way. The promotions page is “colourful”, most of the time that is. Horse racing and greyhounds seems to be their thing, but there's always a promotion for NBA and soccer. Of course, most of these promotions are based on the trending events, so that match or race you wanted to bet on, might become more interesting and enjoyable if you check out the Palmerbet promotions page first! As always, check the promotion terms before you seal the deal. If you experience any problems claiming your first deposit bonus, or any other offer, feel free to contact the Palmerbet support team as soon as possible. Unfortunately, due to Australian Law, Palmerbet cannot offer customers live betting via their desktop or mobile sites. However, they still display in-play odds across a range of sports and if you want to get on all you have to do is pick up the telephone. The live-betting menu is easily found on the left hand side of the home screen and if you click on that you will find all the available live betting events. To discover exactly how to place an in-play wager with Palmerbet check out our detailed guide below. Click the ‘Live Betting’ option on the website/mobile app. Find the odds you want. Call 1300 123 238 to place your bet. The minimum bet stake when using the phone is $20. Sometimes it feels too much like hard work trying to find those elusive winners. It takes so much time to study the form and consider the stats, but with Palmerbet you can rely on experts to do the research for you. The Palmerbet Blog is a brilliant resource for punters and it is well known for pointing punters in a profitable direction. Palmerbet customers can access tips for a wide variety of sports via their excellent blog. Whether you prefer to bet on horse racing, AFL, Soccer, Basketball, Rugby or Tennis then Palmerbet’s experts have you covered. With the inside track on a number of horse racing trainers too, the Palmerbet blog is another reason why you should seriously consider making them your go to bookmaker. Sometimes when you land a big win bet or a big multi you feel like shouting it from the rooftops. With Palmerbet it is easy to share your latest big wins with your mates. As they put it on their website, Palmerbet BetBook is a new social interaction platform that connects Palmerbet members through their user accounts. If you opt in to BetBook, Palmerbet will connect you with your Facebook friends and you will be able to see each other’s comments and posts. When you and your friends are logged in to BetBook your bets are automatically posted for your friends to see. This is a cool feature that increases the enjoyment of the overall gambling experience. For full details check the Palmerbet website. Another cool feature on the Palmerbet site is the Quick Multi section. If you prefer to place multi bets on sports instead of singles, then Palmerbet’s Quick Multi section makes placing your bet as easy as pie. 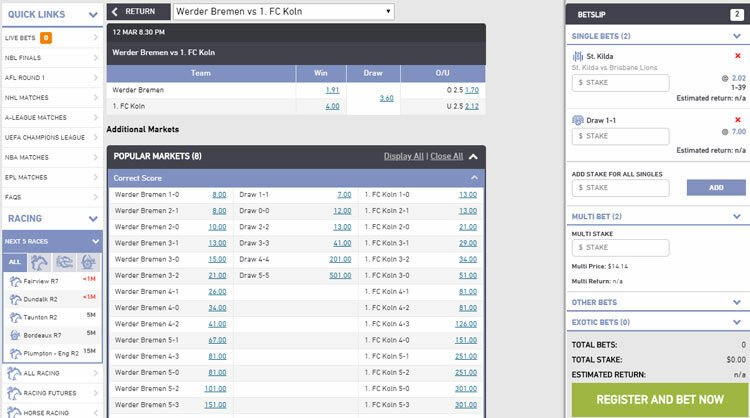 All upcoming matches across a wide variety of sports are displayed in the Quick Multi section of the Palmerbet website. All you have to do is scroll down, find the teams you want to bet on, choose your stake and place your wager. Some pay-out limits for multis may apply so make sure to check out our section on staking and pay-out limits below. Unfortunately, at this present moment Palmerbet do not live stream any events. Live streaming of racing and other sporting events is becoming increasingly common with other Australian bookmakers. You should check out our other betting agency reviews to see which bookies live stream racing and sport. Palmerbet have no streaming service, but hopefully it is something they introduce in the future. How Good Are Palmerbet Sports Odds? There is no doubt that one of the key things to consider when opening an account with a bookie is how good are their odds and how many markets do they offer. Palmerbet scores well when it comes to odds on sports, but they fall down on the number of markets they have available. Unibet, for example, have a total of 267 different markets for the recent Premier League clash between Arsenal and Man City. Palmerbet only have a total of 85, well below the industry average. However, it is a case of quality rather than quantity with Palmerbet as their odds make up for this shortcoming. We compared the odds on offer from Palmerbet and Crownbet for the Arsenal vs Man City clash. We did the maths and discovered that Palmerbet had an over round of 105.55% on the home/draw/away market. Crownbet’s over round was 108.11%, a big difference of over 2.5%. It is much the same for most other sports, and when it comes to odds Palmerbet are more than competitive. The Cash Out facility has become extremely common with lots of Aussie bookmakers. This tool allows you to cash in a bet or multi before the wager is complete. Unfortunately, Palmerbet do not offer a cash out facility. This is a big pity and hopefully it won’t be long until they introduce a Cash Out feature. Betting on the move has increased in popularity in recent years down under. 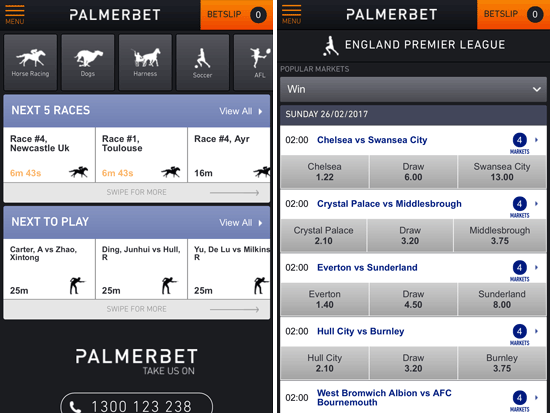 The vast majority of bookies have a mobile or web app, and Palmerbet are no exception. No matter what your preferred device may be, you can bet on the go with the Palmerbet Mobile and Web Apps. With quick and easy access to a multitude of markets for sports and horse racing, they are well worth checking out. If you use an iPhone/iPad/iPod Touch you can download the Palmerbet App via the App Store. IOS 8.0 or later is required and age restrictions apply. The Android App can be downloaded direct via a link when you visit the Palmerbet site on your device. Blackberry, Nokia and Windows Phone users can bet on the go using the Palmerbet Web App. Just visit the site on your device and start betting! Not many countries host a race that stops a nation, but Australia does with The Melbourne Cup. For centuries horse racing has been held close to the heart of Australians and it remains one of the nation’s favourite sports. Palmerbet originally started out as an on track horse racing bookie, so it is no surprise that their horse racing product is up there with the best. All the usual horse racing betting methods are available with Palmerbet, including win, place and each way. Other bets include exotics (exactas, trifectas, quinellas, first 4s and quaddies), Tote +5% or +10%, Best Of Two, Middle Tote, Top Fluc or Tote and SP. Best Of The Best (BOB) bets guarantee the highest dividend of the Top Fluc and the best Tote Dividends on selected metropolitan races. When it comes to odds on horse racing, Palmerbet do not take any chances. While their sports betting odds are generous, their early fixed odds prices for horse racing are not. We compared early prices for a couple of horse races and both Crownbet and Unibet offered bigger odds. However, if you are a registered horse racing owner the Palmerbet Owner’s Odds feature allows you to back your horse at BOB odds. Certain stake/win limits apply so check terms and conditions for full details. Maximum dividend of $101.00 on all thoroughbred racing ($51.00 harness/greyhounds). Max pay-out limit of: $200k metropolitan gallops meetings; $100k non-metropolitan gallops meetings; $50k for greyhound/harness meetings. Max bet of $250 on BOB bets. Max pay-out of 30k on Best Tote+SP bets. Max pay-out Flexi Bets: $100k metropolitan/$50k non-metropolitan. Max pay-out quinellas/exactas/trifectas: $50k metropolitan/$25k non metropolitan. Max pay-out quaddies: $300k metropolitan/$100k non metropolitan. *Other limits may apply please see Palmerbet Terms and Conditions for full details. Instant Deposit Methods: Credit/Debit Card, POLi. Non-Instant Deposit Methods: BPay, EFT. Minimum Deposit/Withdrawal: $10 (credit card/POLI) $25 BPay. Banking facilities should also be closely considered when you are deciding which betting company is right for you. Palmerbet offer a number of ways in which to deposit or withdraw funds to your account and they are listed above. Before you can make any withdrawals your Palmerbet account must first be verified. To find out how to verify your Palmerbet account check out our handy guide below. Open a Palmerbet account by clicking this link. Click on ‘My Account’ message once logged on. There are three ways in which you can verify your identity. Automatic: For Aussie citizens only via use of Edentity service. Online: Aussie citizens only. Use driving licence/passport/Medicare details. Post: Send a certified copy of one of the listed ID documents to Palmerbet. Credit/debit cards must also be verified via the My Account section. No matter what the business, the provision of quick and courteous customer service should be a top priority. When it comes to taking care of their customers Palmerbet are in mid table when compared to their competitors. Unlike many other betting agencies they do not provide a live chat service, and their phone lines are not open 24 hours. You can find out how to contact Palmerbet below. Telephone: 1300 12 HELP (Mon-Sat 8am to 6pm). Post: Palmerbet, PO BOX 1036 CRONULLA, NSW, 2230. Is Palmerbet A Bookmaker You Can Trust? If you are opening an account with a new bookmaker it is important to know that they can be trusted. A lot of personal information changes hands, much of it sensitive, and it is imperative that your information is kept safe. Palmerbet has been in existence for over 30 years and they have built a solid reputation in the industry. Below we outline some of the key security measures that Palmerbet have put in place. Palmerbet vows to protect the personal information it holds from misuse and loss. Sensitive information will be protected from unauthorised access, modification or disclosure. Palmerbet uses the very latest technology on their desktop and mobile apps to ensure secure transfers of funds. This ensures that your information is kept safe from potential fraudsters. Credit and debit cards must also be verified as an added security measure. 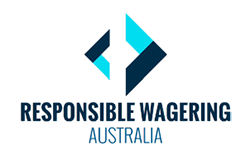 Here at Aussiebet we are big believers in the promotion of responsible gambling. We were glad to discover that Palmerbet have the same attitude. Sometimes gambling can creep up on you, and before you know it you are losing or betting more than you can afford to lose. If you are concerned about your gambling habits Palmerbet have a number of procedures in place to help. Pre-Commitment limits – for control over how much you spend with pre-committed limits. Self-exclusion: If you feel the enjoyment is gone from gambling you can self exclude with Palmerbet. A tool to easily keep track of transactions. Staff trained to spot and help deal with potential problem gamblers. A wide variety of links and contact details for gambling support services. Overall, we were impressed with what Palmerbet have to offer. Just like with any betting agency there are positives and negatives, and with Palmerbet the plus points just about outnumber the minus points. The biggest let downs for us with Palmerbet were the lack of a cash out facility, less than generous fixed price racing odds and no live streaming of sports and racing. These are all areas where Palmerbet have a lot of room for improvement. However, there are a lot of positives to consider too, generous odds on sporting events and an excellent depth of markets for horse racing betting. Their mobile apps work smoothly and we liked their approach to the promotion of Responsible Gambling too. Palmerbet is 100% Aussie owned, and if patriotism is important to you then Palmerbet could be the perfect choice. Palmerbet have put in place all the measures to ensure your betting and wagering experience is not just a good one but a safe and secure one too. From payments to responsible gaming, they will look after you.